March has been a demanding and energizing time for the Center. It began with our Annual Meeting on March 8th. David McMahonand Colleen Hilferty, recipients of the our 2016 Community Peacemaker Award, spoke of their fine work at Dismas House and Dismas Farm on behalf of released prisoners. Straight Ahead Café provided the refreshments. 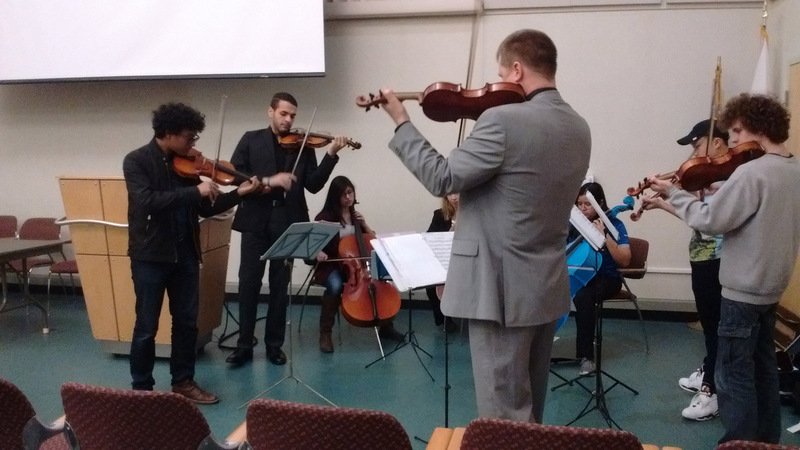 Young musicians from Neighborhood Strings, a regular feature at our Annual Meeting, graced us with glorious music. The talent of those kids advances with each passing year. The evening’s program also included a brief report on our spring programs, as well as a financial summary. The highlight of “Why is Peace Important,” a short radio clip created and produced by 16-year-old Therence Nthihinduka, a participant in Voices of Peace, our youth radio project. Look for Therence’s audio clip and many others on our Facebook page. Twenty people turned out for our Social Justice Happy Hour March 23rd at the Sahara Restaurant on Highland Street. Dr. Laurie Ross of Clark University spoke on exciting peacebuilding initiatives in the city to reduce youth violence. A lively discussion followed and people lingered to network. The evening was our most successful SJHH to date. Our next SJ Happy Hour is Thursday, April 27th with Asima Silva. Mark your calendar and join the growing community of peace educators. As always, thanks for supporting us with your interest and donations. You keep us going.